A rampaging Superbaby. A less than Wonder-ful possession. A funny voice. A fractured recollection. A world with little hope. A twist of the quiver. A killer in the midst. Within the first few pages, the varied members of this massive creative team have taken common horror themes to heart. Inescapable fear, twists and turns marked by suspicion, the blurred lines of reality and terror all transform the familiar DC universe into one beyond our deepest nightmares. Each of the stories takes on a different aspect of the horror genre, whether through ghosts and spirits or violence and aggression, and each of them turns our beloved characters into something truly surreal. Some stories are familiar, while others offer a new take on familiar faces, and Giffen seems to have put a solid framework behind these retellings and alternate worlds. Keith Giffen is the mastermind behind every plot. 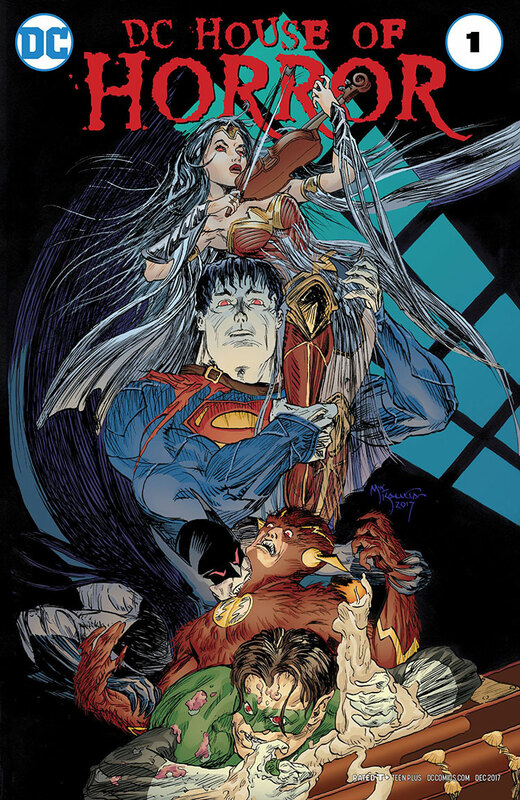 I can only imagine what helped to give inspiration to each story we see in DC House of Horror, but I do admire that many of them take a different aspect of this broad genre and apply them to DC characters. It’s one thing to imagine monsters in the attic, but Edward Lee, Howard Porter, Hi-Fi and Rob Leigh craft a reimagining of the Kent family that is as surprising as it is jarring. The baby that emerges from the alien ship is not close to our own species, but a monster which terrorizing Martha, leaving me to wonder what it would be like to be hunted not just by a creature but one who has heat vision. Lee takes us through Martha’s mind, while Porter and Hi-Fi artistically portray each moment of building terror and fear, moving from her normal reality to one signified by superhuman feats. Mary Sangiovanni, Bilquis Evely, Mat Lopes, and Taylor Esposito tell a story of a woman possessed with the strength of an Amazon tearing through anyone in her path. With parallel storytelling, we see events unfold in the present and what transpired before. Sangiovanni uses sparse language to guide us through what is happening, and we are much as clueless as the people dispatched by the protagonist as the story unfolds until it is made clear by the end. Evely draws Jay as stoic and increasingly powerful as events transpire, connecting her demeanor to to the target of her vengeance. Lopes’ colors come in two schemes: eerie cools and dim but warm earth tones. The next story, by Bryan Smith, Brian Keene, and Kyle Baker, features Harley Quinn as a haunting presence. She hearkens to hallucinations, but read as a ghost story, this tale is just as strange. Smith and Keene’s pace works fast, mirroring the main character’s mental state and putting Harley’s core qualities into a setting which are used to deepen derealization. Baker illustrates a distorted environment with distorted people, leaving Harley as an image which seems the most structured and clear. In a world where Chuck is trying and failing to piece his reality together, she is ironically the most normal aspect of the story. Nick Cutter, Rags Morales, Lovern Kindzierski, and Wes Abbott follow the previous story with one about another comedic yet menacing presence. The Joker dots Bruce’s recollection of his past, skewing the story we know and that the Dark Knight has constructed for himself. As the story progresses, Cutter shows an unraveling Bat, one whose connection to the Joker is far more intimate than both he and anyone else could surmise. Rags Morales makes the world feel increasingly chaotic, while Kindzierski deliberately covers panels in violent reds to give us the jarring truth behind Bruce’s dialogue. Keene comes back with Scott Kollins, Romulo Fajardo, Jr., and Josh Reed to deliver a slightly different take on one of DC’s most common phrases and the story which spawned from it. This time, though, the light of hope is not going to save anyone. Keene puts Hal Jordan at odds with his friends, most notably a zombified Barry, and it’s clear very quickly that things are increasingly bleak for the Lantern. Kollins skill for drawing contorted bodies is excellent for this story, immediately marking the infected in distinction from Hal. Fajardo Jr.’s muted colors help to portray the undead flesh in every character. Ollie and Dinah are surrounded by suspense in the next story by Rondald Malfi, Dale Eaglesham, Jordan Boyd, and Pat Brosseau. Ollie is the mysterious Arrow Killer, a manifestation of the common adage of the slippery slope of killing as a superhero. Eaglesham’s panels are rough and slanted, much like Ollie in his descent into murder. While Ollie is presented with shadows, many of his features obscured, Dinah is drawn with clarity, except in one specific panel that shows how similar she is to Ollie, a major element of the art which helps the story. Boyd uses a stark blue in Dinah’s image to slowly distinguish her from the rest of the story. Even her flashback scenes are put into a similar but still contrasting scheme compared to other images. Wrath James White, Tom Raney, Gina Going-Raney, and Sal Cipriano mix horror and suspense from reality and DC’s fiction. While a serial killer is on the loose, a city is in disarray and people are revealing their true faces. White gives us a convincing plot through the story, touching on the dissolution of humanity in the face of disaster and offering a nice reveal in the climax of this story. Raney manages to maintain the realism of a detective story even with a giant monster on the rampage, using violence and gore as significant marks on the story. Going-Raney uses certain hues to evoke a slowly building suspenseful vibe throughout the story, hinting on the darkness in the atmosphere but also within Harvey Dent as the main character. What I love about DC House of Horror is that it draws on powerful themes within horror: fear, terror, the supernatural, breaking from reality itself or from the illusion of a safe world. Using DC characters as the anchor brings new life into their mythos and seeing how they manifest through the lens of the horrific is a sight to behold. With horror themes also come some of their issues. People of color and women within horror must be portrayed in particular ways so as to not delve into more problematic themes within their place in horror. Few women in this story turn gender tropes on their face, and many of them are at the mercy of some force, whether a killer, a monster, or a spirit. People of color aren’t very present in this story except as victims or thugs. Part of the issue with many horror stories is that it reduces non-white and non-male bodies to common and base ideas. I relate this much to slasher films, which may seem progressive, but for most if not all of their history are predicated on patriarchal ideals and the disposability of colored bodies. Reading this anthology was a chance to unpack certain politics while also examining what horror is at its core. It is variable, it has many iterations, and it can be an important message of the world around us. However, it also can reflect atrocities in our lived world and experiences. DC House of Horror takes all these to heart, for good and for bad, and allows us to envision a darkest universe that turns capes from symbols of hope to the representation of fear.